Do you wish you could escape and do work you love? I often get emails that go something like this: I’m in a job I hate. How can I escape and do work I love? I could try and give people a formula to follow. It would make them feel good. My answer is rarely what most people want to hear, but if you’re ready for real change, it’s exactly what you need to hear. You see, there’s no quick fix. No shortcut. The bottom line is that you need to look inside before you look outside. 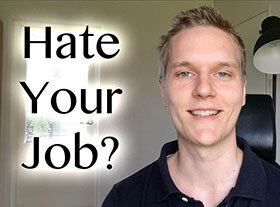 Below is a 5-minute video where I share what you can do when you hate your job, and why escaping may not always be the best idea. And remember, if you want more helpful videos like the one below, make sure you subscribe to my YouTube channel, because not every video makes it onto the blog. If you prefer text, keep reading. Although I recommend you view the video as not everything will be found in the text below. Before you take radical action and quit your job, notice that it’s not your job making you feel anything, it’s your thoughts. The thoughts you believe determine how you feel. I talk about this quite a bit in my book: Do What You Love. It’s your reaction to your job that makes you miserable. When you believe that you should be doing something else, that something is wrong, or that people aren’t treating you right, you suffer. This doesn’t mean that those things aren’t true. It also doesn’t mean that you should stay at your job if you don’t like it. It simply means that you become aware of how you are creating your experience of your job. When you feel bad, it’s a sign that you can’t trust your thinking. When you’re anxious, there’s an urgent feeling that comes with it. You may feel like you need to do something in the outside world to fix it. But all change starts inside. If you quit your job, you’ll bring yourself with you. You’ll bring your thinking with you. Your circumstances may change, but you may still find things to hate in a new job. Find ways to be in the present moment with the job you have now. Notice what you like about the job you have. The reason for this is that if you need that job, you’ll be happier when your thinking shifts. And when you feel better, when you stop being angry, you’ll gain clarity, and you’ll be able to make a better decision about whether you should quit or not. When you feel better, you have greater access to your wisdom, your heart, and your innate creativity. I know that you may want to take action right now if you feel bad, but that feeling doesn’t come from your circumstances, it comes from your thinking. Life isn’t always about what you do, but how you do it. Become aware of how you’re creating your own suffering. Let yourself calm down, and then make a decision. Sometimes it takes time for your heart to make its desires known. You are 100 percent right Henri. I have to keep reminding myself of this. I love the saying “where ever you go – there you are”. You bring yourself and your thoughts with you. So true. When I was in the military we had a saying: The worst place you were ever stationed is where you are now. The best place was your previous duty station. It’s so easy to see problems with your current situation and to think that there once was (or in the future will be) a perfect place. I agree that until a person changes their thinking patterns they will not find the peace they are seeking. Oh, thanks for sharing that. It’s practical and to the point. We’re always looking for ways of escaping the present moment. But it’s often not our circumstances we want to escape, but what goes on inside of ourselves. Absolutely and 100% spot on! 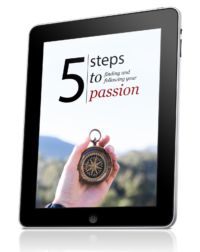 I’ve been following your work for the part 2 months or so and I have to say it’s really very good stuff, precisely because you take a holistic approach to the problem of finding your passion. I think this video summarizes very well things that one can find in some of the best psychology/meditation books out there. But I also think it takes a while to really understand and put into practice what you are saying here. 🙂 That’s the way it is… if ti was easy work, everyone would do it immediately. It definitely does take time. It’s taken me years to reach the place I’m at today, and I’m constantly growing and learning more. It never stops, which is why it’s so important to learn to enjoy where you are now. The journey always continues. Brilliant, a great reminder Henri, thank you. It actually happened the other way round for me, my job quit me, I wouldn’t say I hated the job, but I knew that I wouldnt be staying there for too long, I didnt want to be working for the boss, and with some of the guys and working the way the company was run. … and so, the universe heard me and gladly gave me what I asked for, and the boss shut down the section i and another guy was working for, so I did indeed get what I asked for, but just not at all the way I intended it. But after I got over the initial sickening feeling and the thoughts of, “what the hell am I going to do!” I just told myself, that I have asked for this (claiming responsibilty for me life and not being a victim) and just allowed wonderous thoughts of what adventures would be happening next and what was going to happen to me next to allow me to move forward in my life. So linking back to Henris’ orignial post, it’s all about perseption for me. And even if you don’t believe everything is going to be okay, you can notice that freaking out won’t solve anything. It’ll only make you miserable. So if you want to be practical about this, you’ll see that when you’re calm and let life happen, you have a greater chance of spotting opportunities. Thanks Henri, indeed yes, you can either go through it with constant anxiety and trauma, or go through exactly the same situation in calm and wonderment. If things in life are out of your control, theres no point worrying about it, if they are in your control, there is no need for worrying. Thank Henri for this post, and Lewis for sharing your job experience. I had a similar thing happen this past week when I put together a proposal for a prospect who really didn’t understand what I was getting at. When this happens I tend to think there is something wrong with me and/or my approach. I constantly struggle with recognizing what is within my control, and what is not. When I’m able to be clear about my boundaries, I can stay calm, and move on. Keep up the good work, Henri. Good stuff, Paul. And thanks!